The latest shock to Brazilian politics makes for a new bizarre reality — that pretty much every former Brazilian president still living has either been impeached or went to prison, leaving open the question of if there is really any politician left in Brazil who has not been tainted by the multiple years running so-called 'Car Wash scandal' that has long rattled and decimated the Brazilian establishment. As Latin American journalist Filipe Domingues observes, "Now Brazil has a record of 2 impeached presidents + 2 former presidents in jail: Lula and Temer." Brazil’s former president Michel Temer been arrested on Thursday as part of the sweeping and years-running 'Operation Car Wash' anti-corruption probe, regional media reports say, after the predecessor to Jair Bolsonaro left office on January 1. Temer has reportedly been sought by police, who reportedly have been trying to trace him since he left office. 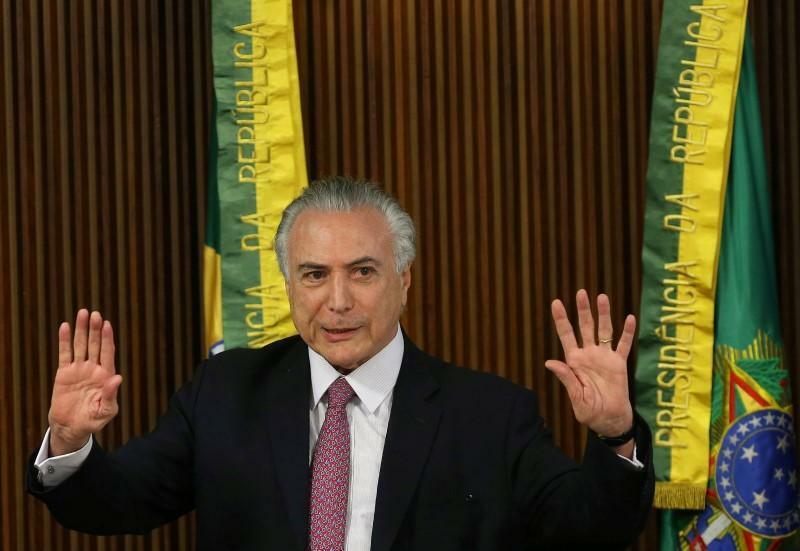 Temer, who served as president from 2016 to 2018 after the impeachment of Dilma Rousseff, has consistently denied any wrongdoing when he was first named as one among the dozens of politicians and business executives rounded up and convicted as part of the multi-billion dollar corruption scandal dubbed Operation Car Wash — named so because it was first uncovered at a car wash in Brasilia. The allegations first came against Temer during his presidency in 2017, but which were blocked by allies in Brazil's congress. The sprawling investigation, involving at least 6.4 billion reais ($2.0 billion) in bribes for contracts with state-run enterprises, has charged 200 people and convicted more than 80 executives and politicians. Temer's long-time-in-coming arrest happened Thursday morning in a police raid on his house in Sao Paulo, after which he was transferred to federal police headquarters in Rio de Janeiro. Brazilian news portal Globo further reports former energy minister Moreira Franco is also being sought by federal police, who is also facing graft charges. Per Reuters Brazil's currency slipped as much as 1% on the news, with the Bovespa stock index quickly falling 1.5 percent. Since 2014 Brazil has been gripped by a scandal that started with a state-owned oil company and grew to encapsulate people at the very top of business - and even presidents. On the face of it, it is a straightforward corruption scandal - albeit one involving millions of dollars in kickbacks and more than 80 politicians and members of the business elite. Specifically prosecutors have told international media outlets that their charges against former president Temer have centered on alleged graft in the construction of nuclear plant Angra 3. Meanwhile two former presidents who have found themselves under investigation since 2014 — close allies Dilma Rousseff and Lula — were also famously brought down over Operation Car Wash and similar corruption-related charges, with the former impeached and the latter spending time in prison. 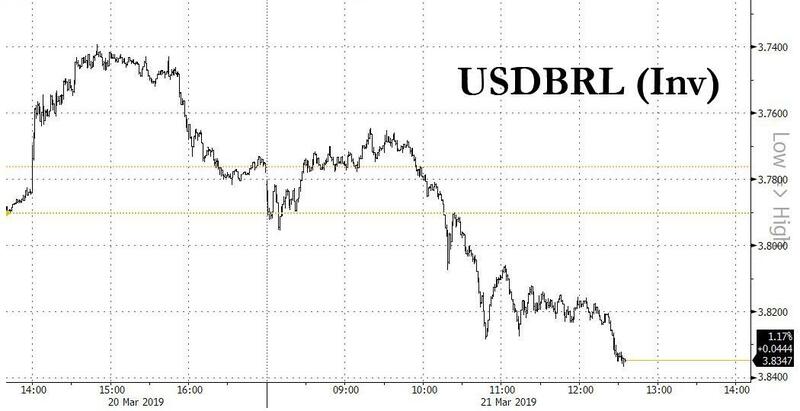 After jumping yesterday following the Fed's dovish doubling down, the Brazilian Real has sold off hard on the report, although as Bloomberg suggests, the kneejerk reaction will soon reverse as Temer "doesn't have much credibility left to lose, and his party has just 34 of 513 seats in the lower house, so it's not obvious that this would hurt pension reform efforts." However, according to Bloomberg's Sebastian Boyd, markets should be more concerned about a recent Ibope poll showing that President Jair Bolsonaro's approval rating fell 16% since January, which is likely "to have more effect than Temer's legal problems."